Jack of all spades in Sussex! When you first meet Jack Dunckley (above), and hear what he has to say about gardening, it's hard to believe he's only 17! This young man has already been a silver medalist at the Hampton Court Flower Show (2009); would have been at Chelsea this year if his backer hadn't pulled out; and is now getting ready for Hampton Court again in July. Jack first hit the headlines back in 2008 when he became the youngest-ever entrant at the Malvern Spring Flower Show, and again last year with his silver medal at Hampton Court for his "Desert Delight" garden. His theme this year is a "Formal Cottage Garden" and when I met him last week, he was busy checking his plants for the show - some 20,000 being grown for the 15 sq. metre garden! 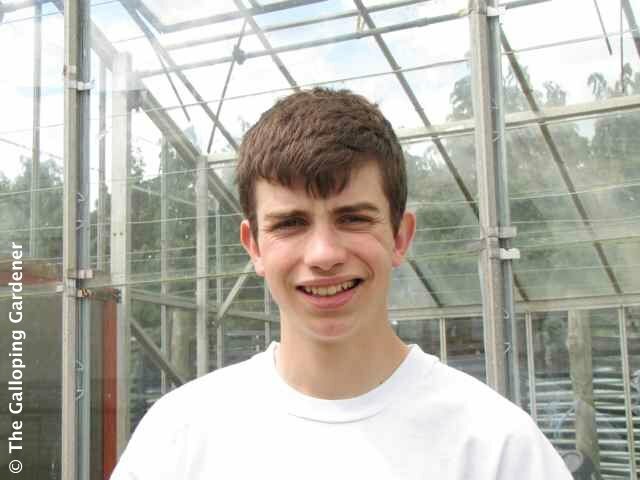 Jack has been passionate about plants since he was a young child. He's completely self-taught, but has always loved gardening and is hoping to do a three-year diploma at Kew when he finishes school. You certainly get the feeling that Jack will be to plants what Jamie Oliver has become to food, and I for one, wish him well. And I couldn't help but notice that all my plants were branded "Jack Dunckley" on the label, so it seems he's already well on the way! He's also got a video - well worth watching to find out more about this promising young man. His parents recently bought Birchfield Nursery just outside Henfield in Sussex and I came across Jack because I buy all my plants there. I was looking for ferns, fuschia and heuchera when I stumbled across the nursery some weeks ago. Since then I've returned many times and have been busy planting in my own garden. Many of you asked for more pictures of my gardens, so here's another tiny slice ... before and after, but I did say it was very much work in progress!! We had to clear the whole area of ivy before we could do any planting (above), but also had to consider that this area gets little sunlight after early morning because of the way the garden faces. 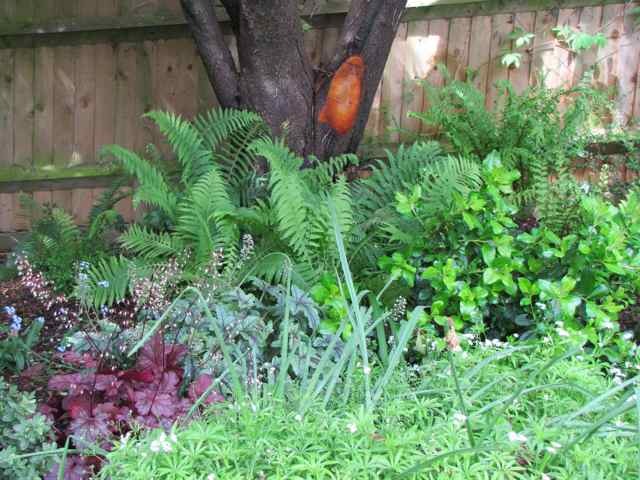 The only solution was to choose shade-hardy plants (below) - all came from Birchfield. What a difference in your shade-hardy garden! Beautiful! And kudos to Jack -- I suspect a "blossoming" career lies ahead. Didn't Jack enter Chris Beardshaw's Scholarship? Like you, I think we will see lots of him in the future. 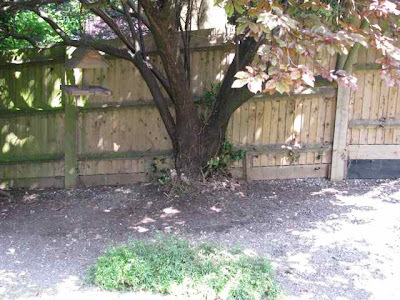 I am delighted that you have showed us your garden, before and after shoots are really helpful. You must be very pleased with this planting, it is beautiful.